If you’ve only got a balcony or paved garden, you may be thinking that you can’t possibly grow most vegetables. But with a bit of effort, you can find plenty of suitable varieties that will grow happily in pots, and many of which will even grow upwards, saving you still more space. We take a look at some of the options, and also provide some tips for growing your own in containers. 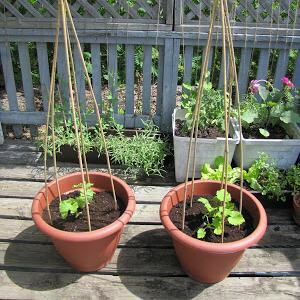 Peas and climbing beans are the traditional options for containers, but you can still think ‘outside the box’ a bit. Instead of runner beans, how about climbing French beans? ‘Cobra’ is a reliable variety, or you could try borlotti beans such as ‘Lingua di Fuoco’, with their gorgeous red-splashed pods. 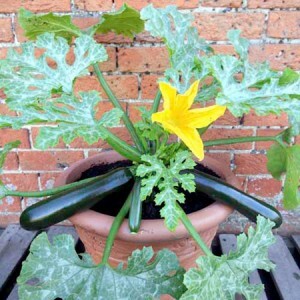 New varieties of courgettes and small winter squashes will happily climb and scramble from a pot, and are easy to grow. Varieties to try include Courgette ‘Tromboncino’, and Squash ‘Sweet Dumpling’. 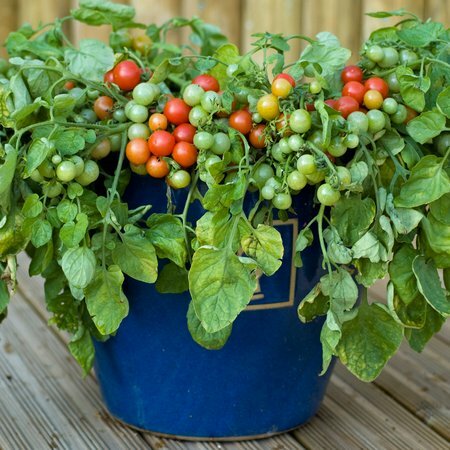 You can also grow tomatoes and cucumbers in pots: try Tomato ‘Tumbling Tom’ in a hanging basket, or gherkins such as ‘Cornichon de Paris’, which can be grown up a bamboo or tripod, as well as along a trellis. Carrots, beetroot and potatoes will also grow in containers, though you’ll want a fairly deep pot to have room for the roots to develop. And old dustbin or half-barrel is ideal for potatoes. As a general rule, you want fairly big containers, as vegetable plants tend to grow quickly, and the more vegetable compost you can put in the better. If you’re going to grow a lot of vegetables, then you may want to invest in a bulk bag of compost from compost suppliers, in which case, mushroom compost and mushroom and manure compost are good choices. If you just want a few pots, then you can buy compost from garden centres and DIY stores, and multi purpose compost or vegetable-growing compost will be perfectly acceptable. Feed your plants regularly. Add slow-release fertiliser to the container before you plant it up, and start feeding after about a month, using a general-purpose feed. Vegetable plants also tend to get quite thirsty, and regular watering keeps them producing. Some, like runner beans, need to be watered all over to pollinate the flowers, so use a spray on a hose, and make sure that you splash water right up the stems. You also need to pick your vegetables. Most plants will produce more if you pick often. If you leave beans, courgettes and the like on the plant, it will stop producing, because it has set seed. Our best tip is if you fancy trying to grow something, go ahead. We have an excellent Grow Your Own section where you can get everything you need to begin. We’d love to hear from you about what grows well.